As part of Women in Sports Day on Feb. 1, RIT will host more than 200 female Rochester City School District students. 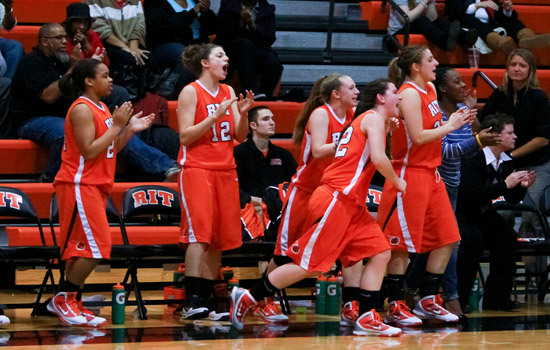 They will have the opportunity to speak with RIT scholar-athletes and cheer on the RIT women’s basketball squad. First Lady Michelle Obama’s “Let’s Move” campaign has opened America’s eyes to raising healthier kids by providing balanced meals and encouraging physical activity. On Feb. 1, female athletes at Rochester Institute of Technology will do their part to help young students stay fit by sponsoring Women in Sports Day. More than 200 female Rochester City School District students—ranging in age from 10 to 16—will arrive at RIT’s Campus Center at 4:30 p.m. The students will be paired with more than 50 female RIT scholar-athletes for an evening of mentoring. Together, the students will also create signs for the Lady Tigers basketball game, which begins at 6 p.m. An autograph session immediately follows. Women in Sports Day is sponsored by RIT’s Division of Student Affairs and the Center for Women and Gender. For more information, call 585-475-7464.